A dish of my crazing cooking adventure. Nothing much to share except the recipe. 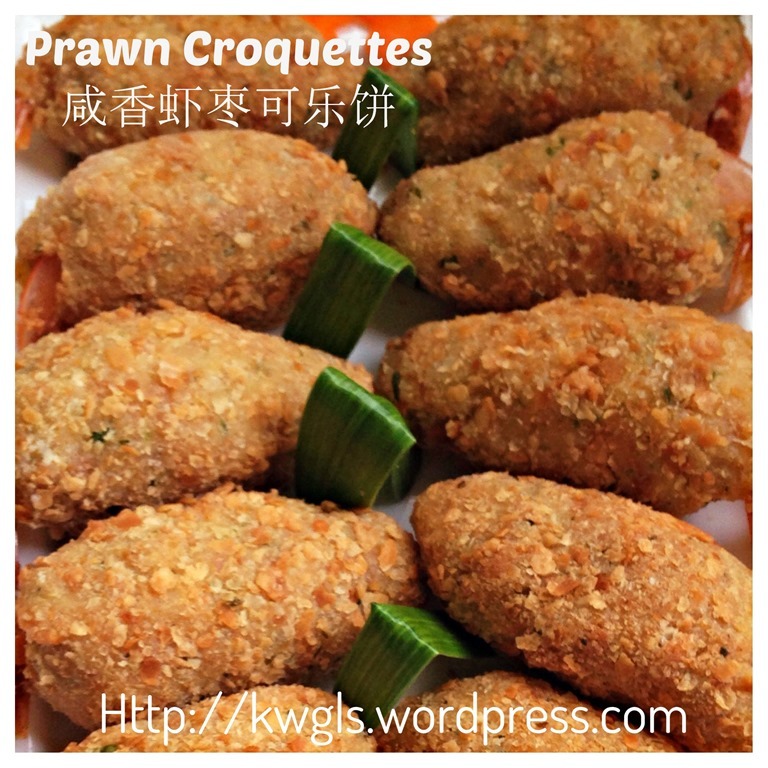 I believed it is presentable to be prepared for entertaining house guests or as a party snack. 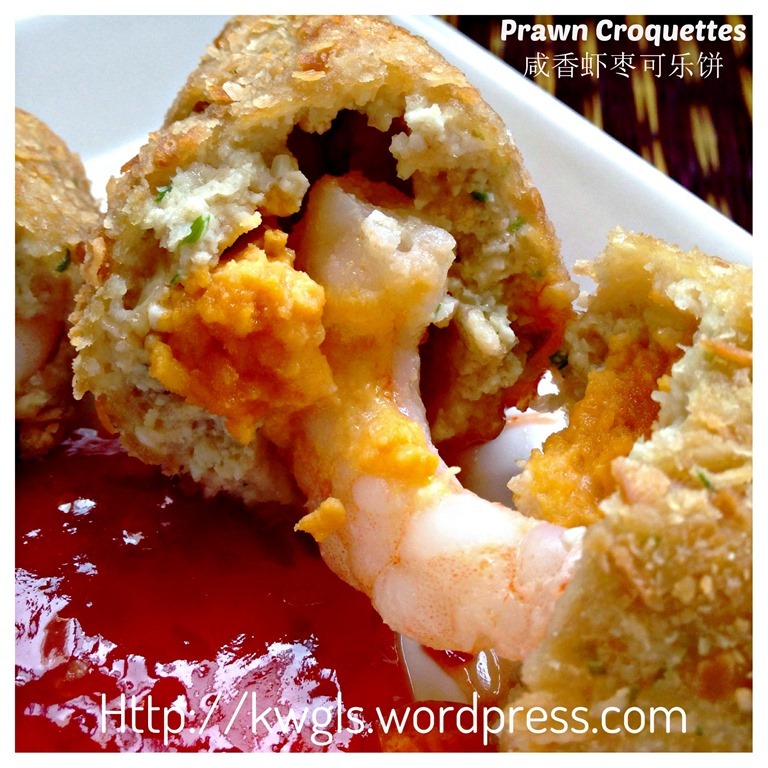 It is some prawns, salted egg yolks wrapped in meshed hard bean curd (taukwa) and salted egg white. Taste is good and family members loved it. Preparation is simple and can be done within an hour. 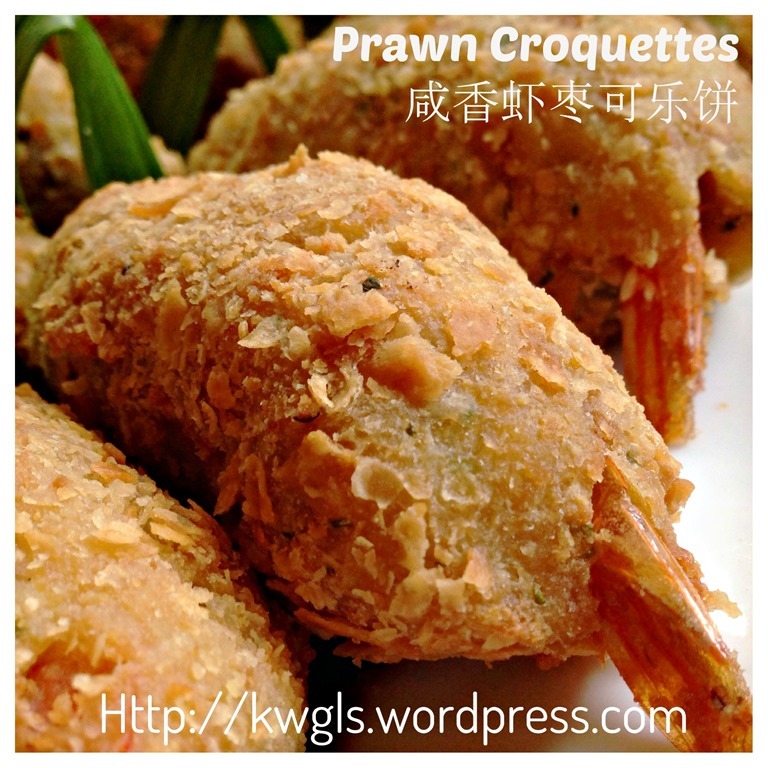 Quantities listed here are mostly estimates as consistent with most savoury dishes. Variations are many and full of flexibilities. 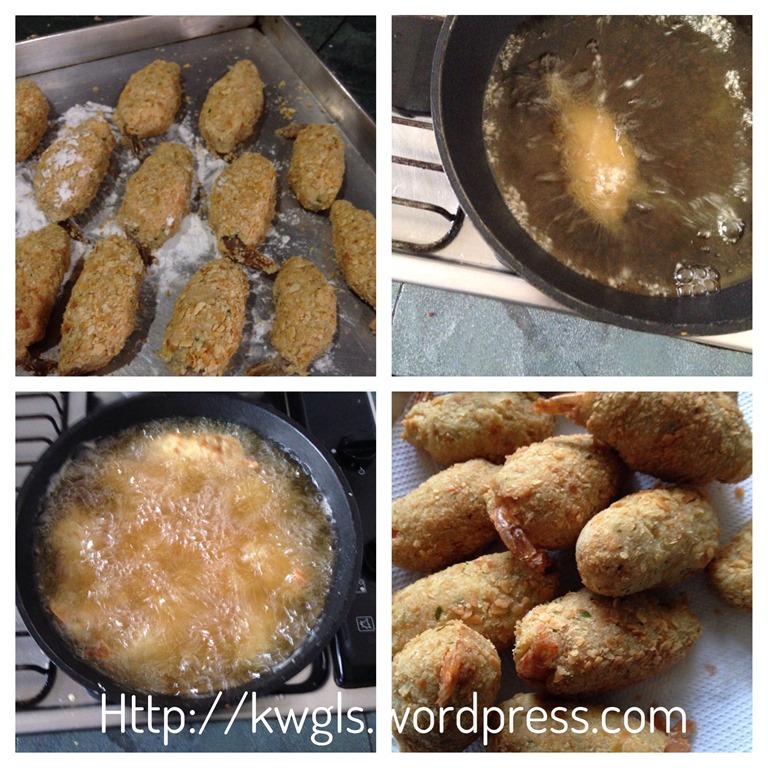 If you want, you can try to use air fryer to fry it. Sauces can be added but is not included in this recipe. Suggested sauce is to drizzle with mayonnaise. It goes well with sweet Thai chilli sauce. 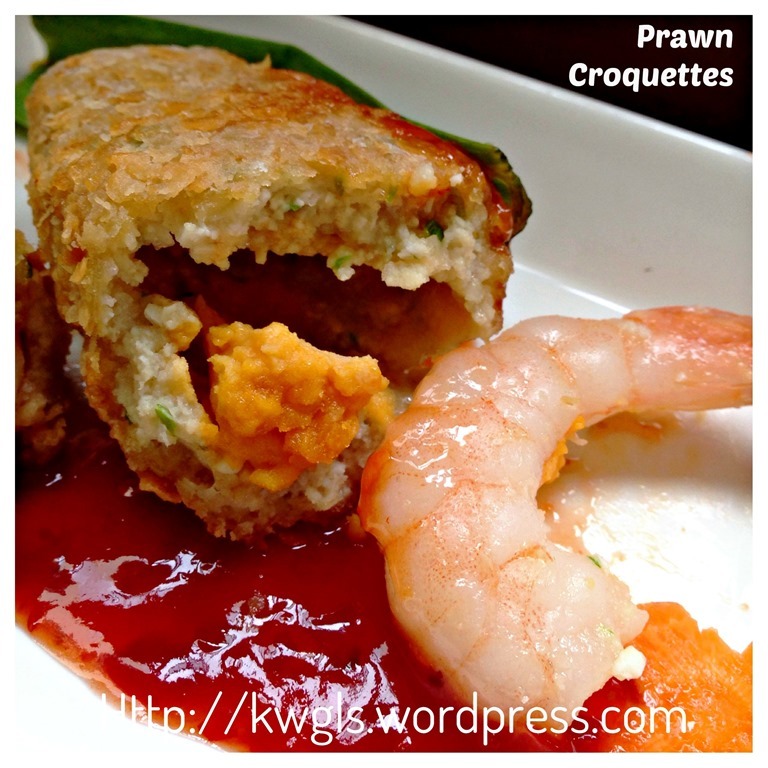 I have a hard time of giving it a name, therefore, I have decided to use a simple name, “Prawn Croquettes” for this simple dish . The name was initiated by my Facebook friends and I have to thank them for helping me to think of a name. 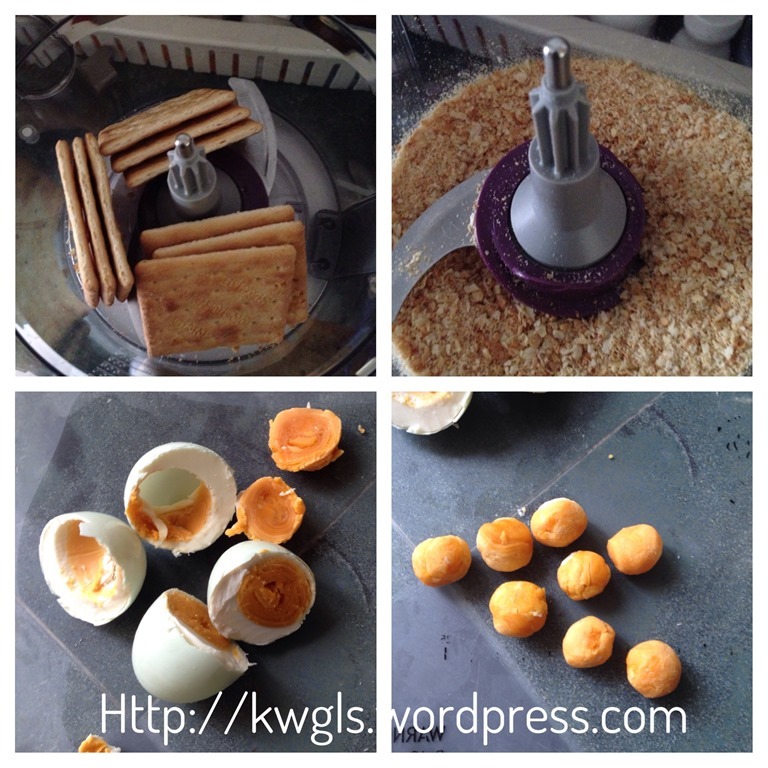 Blend the soda crackers in the food processor until fine. Set aside for later use. 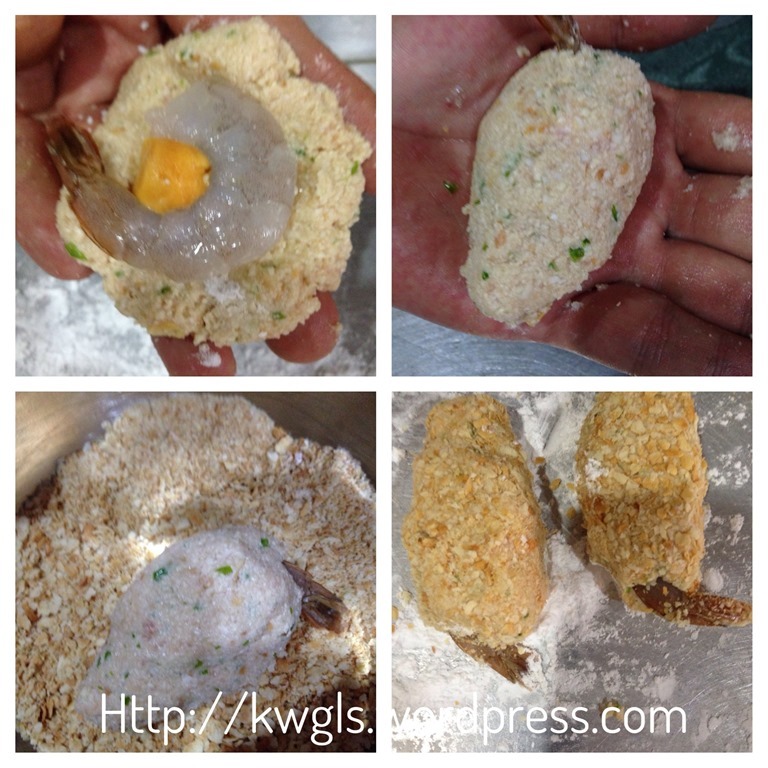 Cut the salted egg into half, take out the egg yolk, meshed and divide into 1o-12 balls. Set aside for later use. 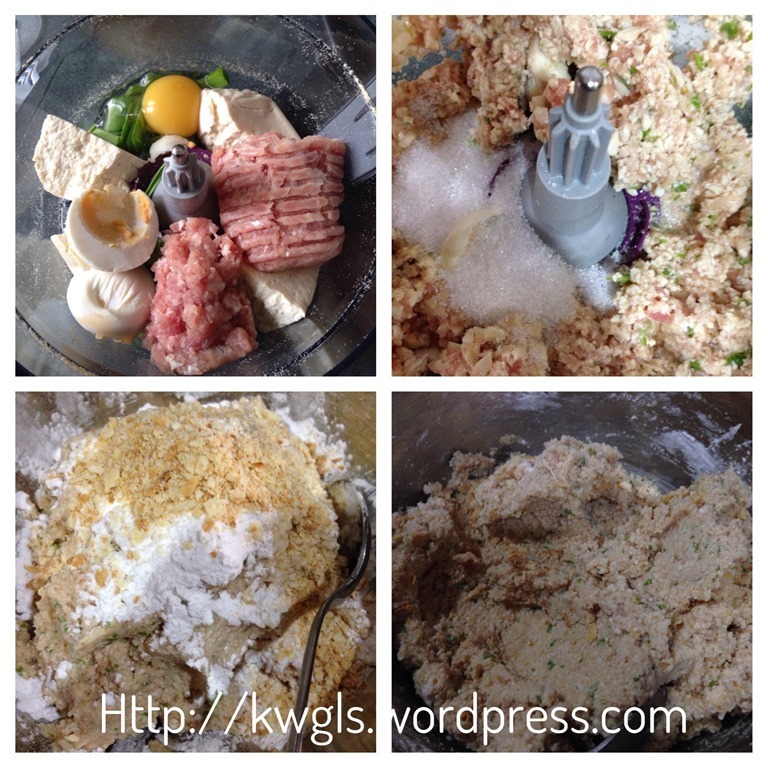 Use the same food processor to blend salted egg white, firm bean curd, eggs, spring onion, corn flour and onion until a paste is form. If the paste is overly sticky, you can add a tablespoon or two of the biscuits crumbs prepared earlier. Add seasonings (light soya sauce, sugar, sesame oil and pinches of salt). Note that there is salted egg in the paste, therefore, your addition of salt and light soya sauce have to take into consideration this. Divide the paste into 10-12 equal portions. 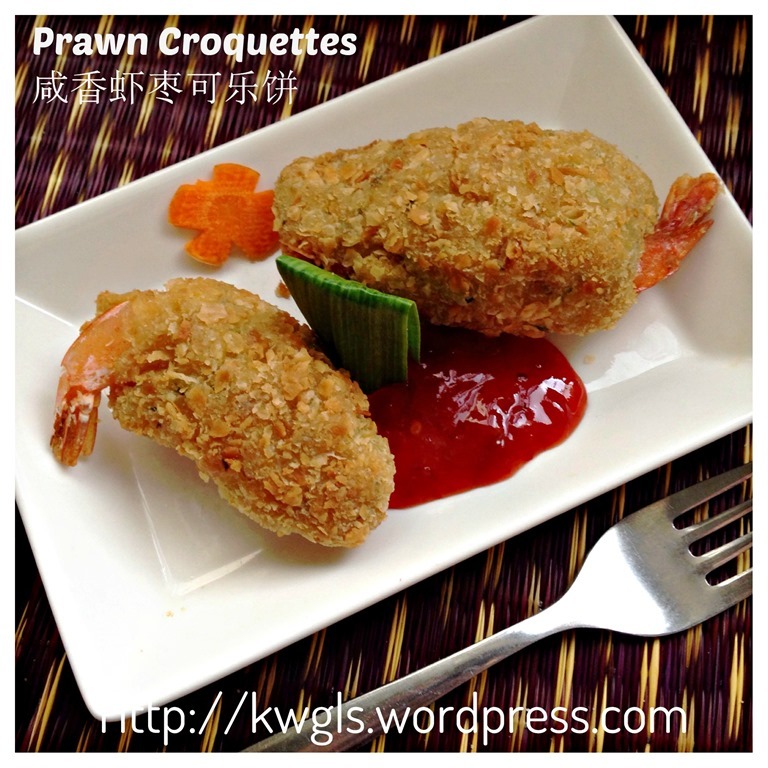 Take a portion, flatten it in your palm, put one prawn and a ball of salted egg yolk. 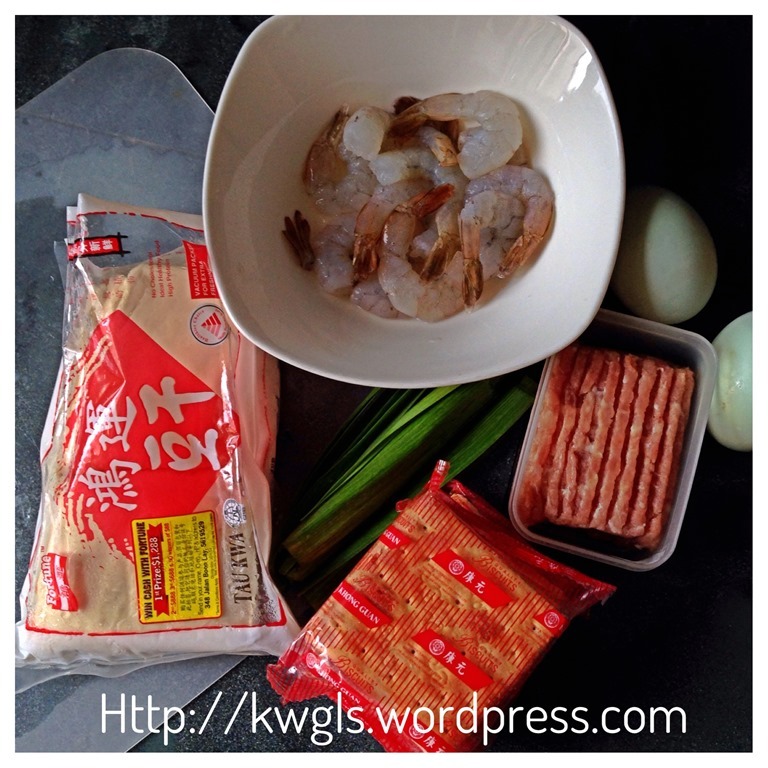 Seal the side and shape it following the shape of the prawns. Roll the paste on the soda crackers crumb prepared earlier. Set aside for later deep frying. If your hand is too sticky can add put some plain flour on your hand to help your shaping. Heat some cooking oil in a pan under high heat. The cooking oil is consider hot enough for deep frying when a wooden chopstick inserted and bubbles start to emit. 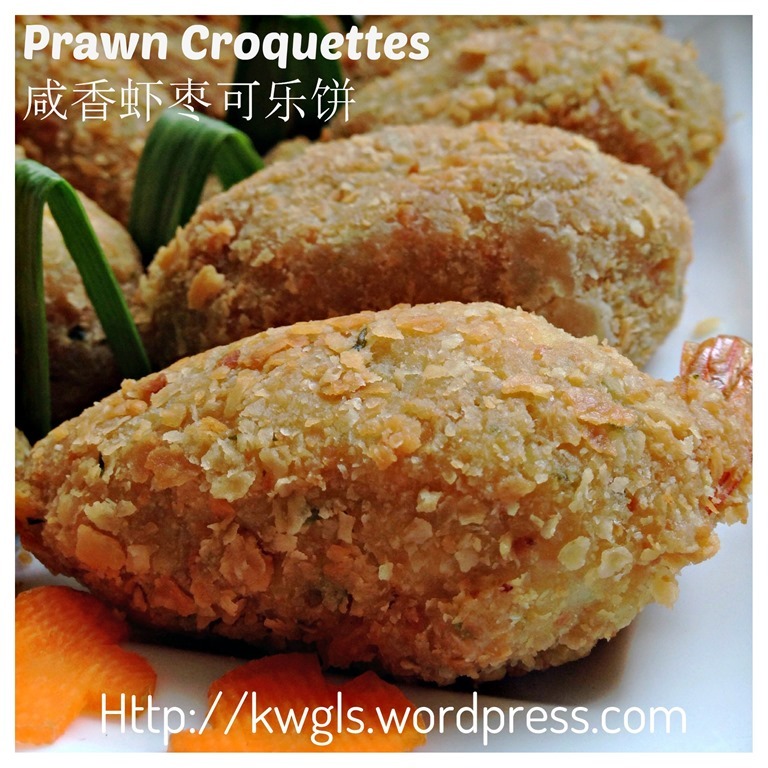 Deep fry the prawn croquettes until it is golden brown in the outer skin. You may want to reduce your heat to medium if you are afraid of getting it burnt. The frying process will take about 10-15 minutes. Once taken out from the oil, drained and put on top of an oil absorbing paper before serving. 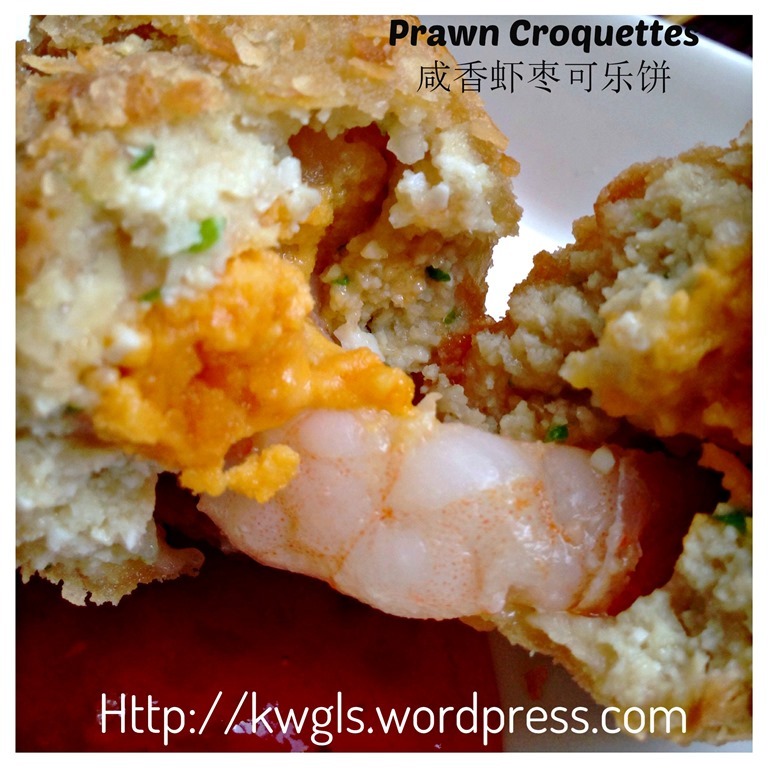 Best served with Thai chilli sauce or drizzle with mayonnaise. 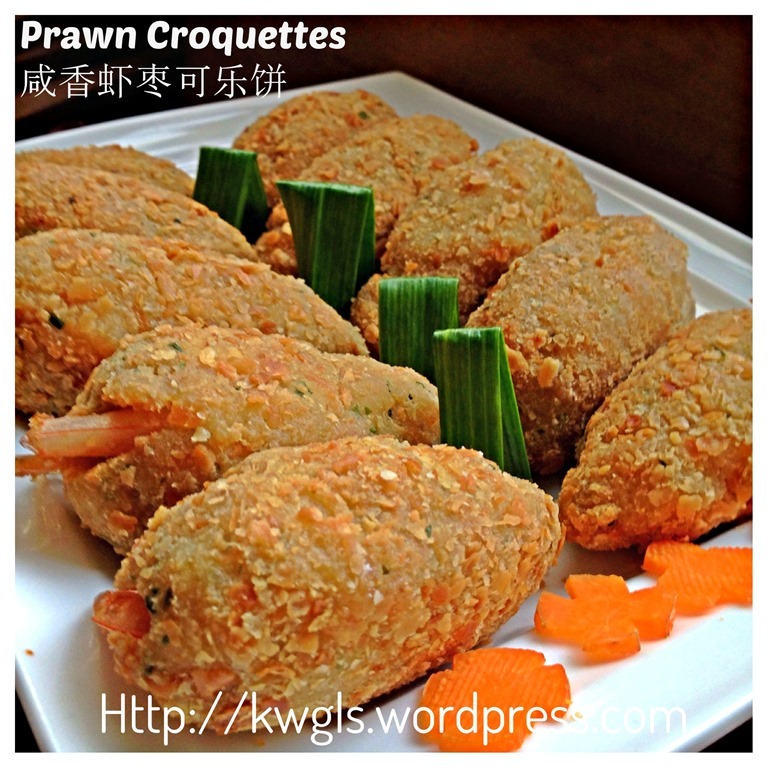 This is great for party snack. 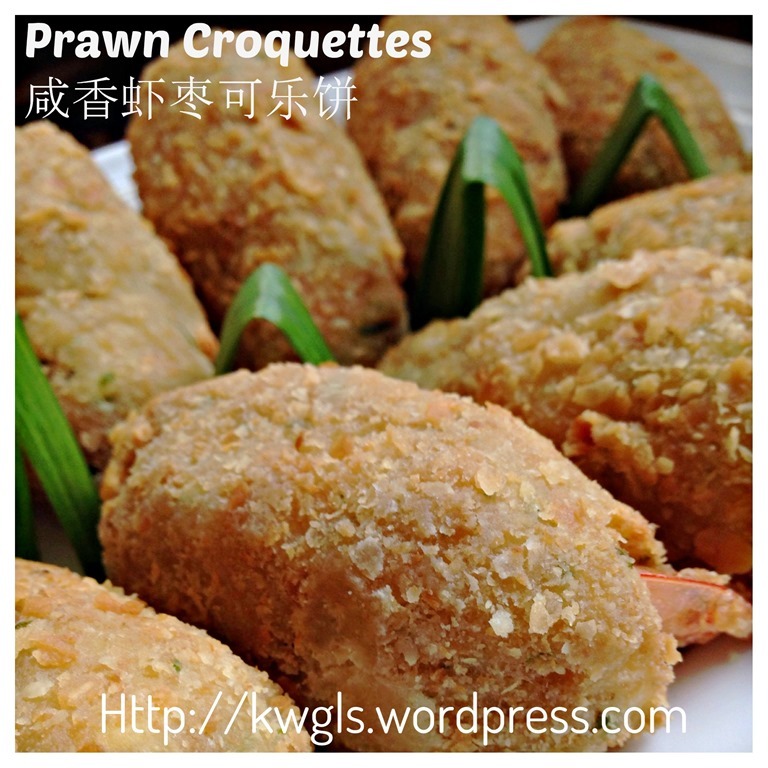 Most of the ingredients are optional and you can easily tailor to suit your family’s taste buds. May be you can consider to add water chestnuts to the paste. 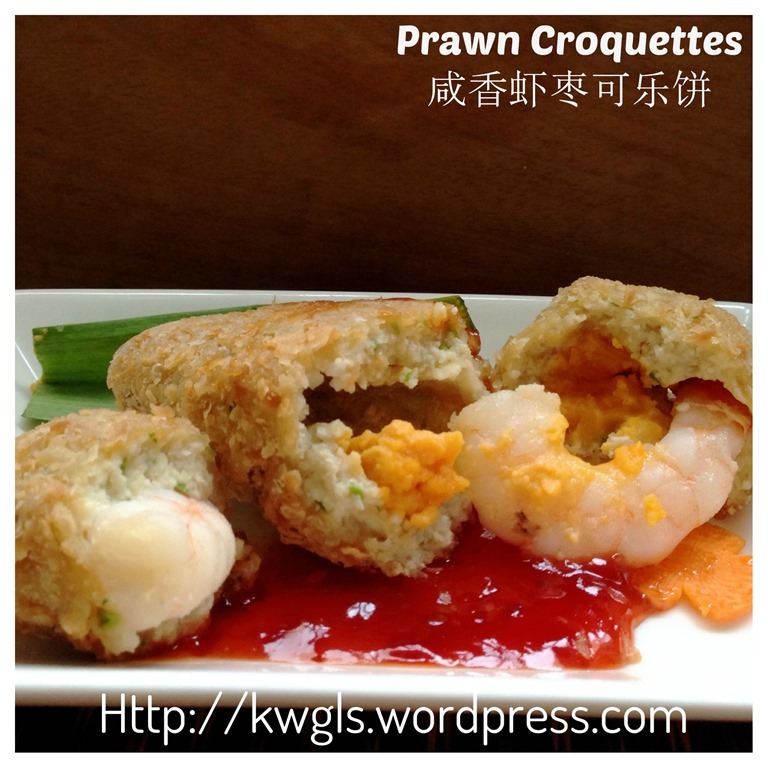 This entry was posted in Chinese and Asian Cakes and Snacks, Dish, Food Preparation Series, Meat Dishes, Seafood Dishes and tagged 8, coquettes, GUAI SHU SHU, Guaishushu, kenneth goh, postaday, Prawn croquettes, 咸香虾可乐, 咸香虾枣可乐饼. Bookmark the permalink. These recipes and photos are amazing. I love the details you give in creating them. You have done a great job; the variety to select from is incredible.